First up, it blows The Pacific away – totally. Like many viewers, I lost interest in The Pacific before it was halfway through…the characters were wooden and difficult to identify with and all the pretentious hype months prior lead to expectations it just could attain. Conversely, after 58 minutes of Generation Kill, the characters are people, easy to identify with…if there is to be a classic to follow in the vein of Band of Brothers, it may be Generation Kill. This entry was posted in The Thursday/Friday War and tagged Influence Operations, Iraq, movies by SJPONeill. Bookmark the permalink. I’ve been trying to push the series into awareness amongst some of my fellow Digs for a while, when everyone is busy raving about the Pacific. Which was rubbish. I really tried to enjoy it too. 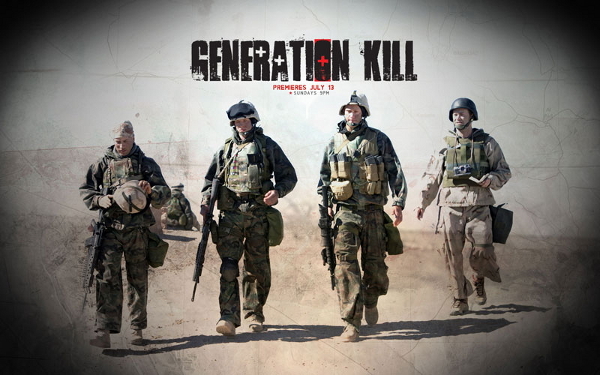 Generation Kill on the other hand, I think can sober the uninitiated’s ideas of the stresses of conflict all wrapped up in a consumable viewing. Its a shame it won’t be advertised as well as The Pacific was.